Online Ordering Has Never Been Easier or More Affordable! Point of Success and BigHoller, a leader in online ordering, are now offering easy, affordable online ordering for your restaurant! Customers order from your BigHoller web menu, then the order is transmitted over the Internet to your restaurant and is brought into your Point of Success POS system. 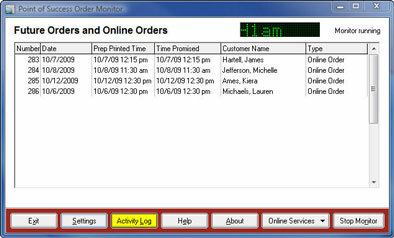 Online orders work just like orders entered by your staff for production, tracking, delivery and business reporting. You’ve read the record-breaking online ordering sales announcements from major restaurant chains – Now you can use the same technology to help improve your business! 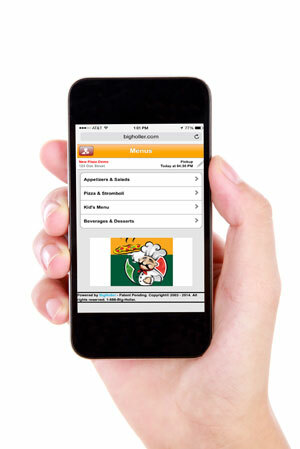 Mobile browser ordering that gives an entirely new, mobile-customized ordering experience on your online ordering site. Delivery zone maps that inform your customer of your stores can offer delivery to their location. Call Center features than let you consolidate your online orders and telephone orders in one interface. 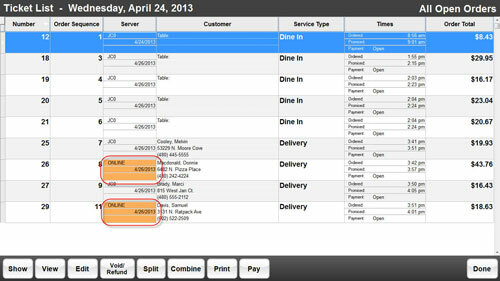 Customers can order through your online ordering menu while your call center agents accept telephone orders. Agents can assign orders to each location to effectively balance your production load. Your customers can pay for their online order using their Vantiv Integrated Payments gift card or StoreCard. A new ordering wizard can step your customers through selecting pizza toppings and customizing elements of a combination item. Unusual addresses like those for hotels, campgrounds and even stadium seats are fully supported. Tax exemption can be assigned by you to individual customers and by menu item. Create house accounts for your BigHoller customers and bill them at the end of each month. 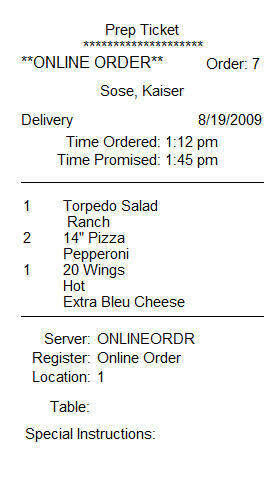 More ability for web designers to customize the look of your online ordering implementation has been added. BigHoller offers a new telephone confirmation service that automatically contacts your restaurant to verify receipt of online orders. 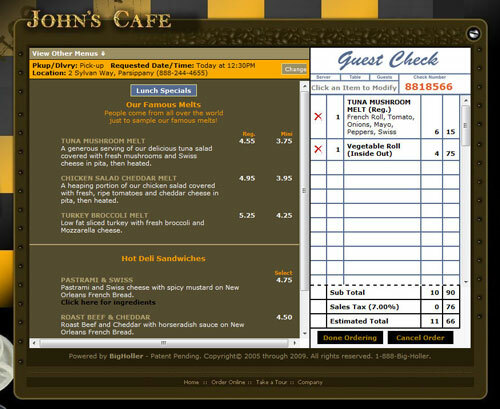 Customers order from your online menu. 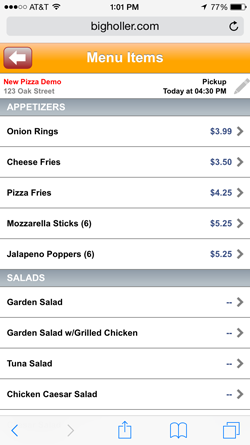 Each item on the menu can have ingredient options, preparation instructions and add-on items displayed for easy access. Customers can review every detail of the order to improve accuracy and customer service. When the order is complete customers enter information required to identify, prepare and deliver the order. Payment can be required on the web site or you can permit customers to pay when the order is picked up or delivered. Pizzeria menus can incorporate BigHoller’s pizza builder. Just click and drag toppings from the topping list, then drop them on the left half, right half or in the center for the whole pizza. 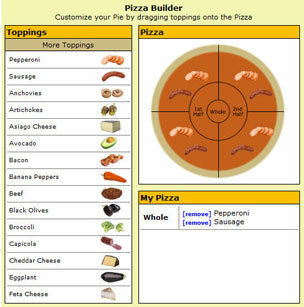 Crust, sauce and preparation instructions can also be selected in the pizza builder. The Point of Success Order Monitor receives orders from BigHoller, holding them until the time you specify to begin preparation. 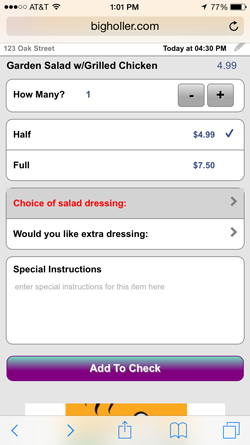 Online orders are specially color flagged to distinguish them from locally entered orders. Each online order follows the same production path as a local order from preparation to pick up or delivery. Point of Success prep tickets and kitchen monitor clearly identify online orders. You’ve heard restaurant owners talk about online ordering. You may have even been asked by your customers if they can order from you over the web. This information may help you decide whether online ordering is worth the investment.